Codemasters scores another one for its racing lineup - the Colin McRae: DiRT and Race Driver: Grid creators acquired the exclusive rights to develop Formula 1 racing games for console, handheld and PC. The deal will let Codies feature all Grand Prix circuits, teams, cars and driver likenesses in its titles, with the first of these to launch in 2009. Calling the license "the jewel in Codemasters' racing crown," the developer-publisher said that snagging the license is a victory for its proprietary EGO game engine and a vote of confidence in its leadership in the racing game segment. As Formula 1 develops more international circuits, it's looking to expand its consumer reach, and seems to have chosen video games as an avenue. Codemasters Studios to drive new generation of FIA FORMULA ONE WORLD CHAMPIONSHIP games across multiple formats. Codemasters®, developer and publisher of award-winning racing video games, has secured the exclusive video game rights to FORMULA 1 it was announced today. In a worldwide licensing agreement with Formula One Administration Limited, Codemasters will develop a new generation of the multi-million selling FORMULA 1 game franchise across multiple platforms. Codemasters Studios, creators of genre-leading racing titles Colin McRae: DiRT™ and Race Driver: GRID™, will lead the design and development of official FIA FORMULA ONE WORLD CHAMPIONSHIP games for home console, handheld and PC gaming formats. "FORMULA 1 is ambitious in expanding its reach with more circuits planned beyond recent additions in the Middle East and China. It is also ambitious in expanding its reach via technology. The digital communities that computer and video gaming creates will play a key role in further growing the FORMULA 1 audience and connecting them globally," said Rod Cousens, chief executive officer, Codemasters. "As a world-leading creator of driving games, this alliance with FORMULA 1 is the jewel in Codemasters' racing crown and creates an undisputed segment champion. FORMULA 1 has gone with the best, the segment leader. It has gone to the home of the EGO Engine for quality; it has gone to the company that can host FORMULA 1 Online, to the company that is streaking away from the pack." "Codemasters' success and recent innovations in the racing game space makes the company more than appropriately tuned for the challenge," said Chris Deering, chairman, Codemasters. "The combination of FORMULA 1's new momentum of expansion and Codemasters' contemporary technology and past experience is the breaking of a new dawn for the sport, on the track and on the HD game screen." The worldwide deal provides Codemasters with rights to feature all Grand Prix circuits, FORMULA 1 teams, cars, and driver likenesses. The FIA FORMULA ONE WORLD CHAMPIONSHIP games will be developed using the evolution of the award-winning EGO™ Game Technology Engine, Codemasters' highly versatile cross-platform middleware technology. Its advanced graphics and physics technology brings an unmatched cinematic quality and realism to interactive entertainment. The EGO Engine is currently being deployed in the creation of Race Driver: GRID™, the latest in Codemasters Studio's international circuit-based racing series. Set to be a landmark release when it launches on May 30th, Race Driver: GRID was recently hailed as"The driving game of the summer" by BBC Top Gear magazine. 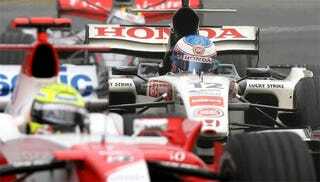 Codemasters expects the first game based on the FIA FORMULA ONE WORLD CHAMPIONSHIP to launch in 2009.